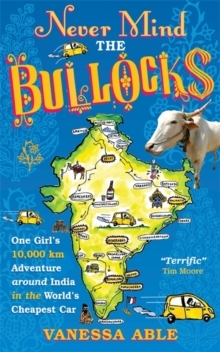 **A Scotsman Non-Fiction Book of the Year** Vanessa Able wanted a truly independent Indian adventure, but nothing prepared her for the noise, chaos and terror of driving 10,000 km around the subcontinent or for finding the love of her life. Behind the wheel of a yellow Tata Nano (the world s cheapest car), Vanessa steers the reader through a hilarious, high-octane adventure. Taking any help she can get from loopy spiritual gurus to professional driving instructors, and even a divine insurance policy she drives her way around an alien road network through India s white-knuckle traffic where vehicle size, full-beam lights and roads that simply disappear seem to trump all common sense. Narrowly escaping death by truck, she learns the real rules of the road, the vehicle pecking order, what to do when the SH11T hits the fan and to appreciate the true kings of the dusty tarmac: the bullocks. En route, she falls hopelessly in love with a mathematician named Thor who might be, ironically, the worst driver she s ever met. Their romance does not start promisingly the first rendezvous is interrupted by that universal passion-killer, Delhi belly but will they survive unexpected sheep-jams, a car full of elephant slime, and the endless cacophony of horns?